Malaysia's second car maker after Proton, the Perodua Kancil (a small Malaysian deer) was based on the former 844cc 3-cylinder Daihatsu Cuore (Mira), and was made as a 5-door hatchback. The first exports went to Brunei, followed by Cyprus and Malta and in 1997, Great Britain where it was known as the Nippa. 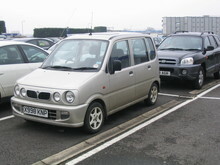 1999 models were available in two versions, standard EX and higher specifcation GX. At just under £5000 the EX was the cheapest car on the UK market.